Echo360 is teaming up with Amazon Web Services to make video content more accessible. The company today announced it will integrate Amazon Transcribe automated speech recognition technology into its video platform, giving each recording a viewable, searchable transcript. Able to detect different speakers within a video, Amazon Transcribe automatically creates a transcript and aligns it with the video based on timestamps, a news announcement explained. Machine learning allows the technology to improve as it transcribes new content. Each word receives a confidence score that gauges accuracy; transcriptions can also be edited. In addition to making video content more accessible for students with disabilities, the transcripts enable students to search for and navigate to key phrases in videos, and the text can be copied and pasted for student notes and study guides. "Video-based learning provides today's students with engaging learning experiences during class as well as outside the traditional classroom," commented Paul Foster, assistant vice president for enterprise academic technology at the University of Cincinnati, in a statement. 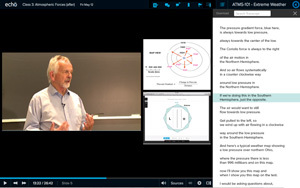 "Because making course content fully accessible to all learners is one of the top priorities of the University of Cincinnati, the collaboration between AWS and Echo360 is a very exciting development. It gives us the unprecedented ability to quickly transcribe instructional speech to text, which enables all students to more deeply engage with course lectures and discussions after class." The Amazon Transcribe rollout is expected to be complete in the coming months. Institutions using Echo360 will receive a quota of automated transcription hours as part of their existing license agreement, and will be able to purchase additional transcription at an hourly rate. For more information, visit the Echo360 site.